In developing the 150th anniversary logo, careful consideration was given to honoring the rich history of Cincinnati Reds baseball with the right selection of imagery. The iconic Palace of the Fans façade proved to be the perfect inspiration for a commemorative mark to honor the team's legacy. By the turn of the 20th century, baseball had fully evolved from its origins as a regional club sport into the national game; an institution that was deeply woven into the cultural fabric of America. In Cincinnati, as the Reds made plans to replace the latest in the string of wooden ballparks the club had called home, the elevated status of the game was given spectacular expression in the form of the concrete and steel park the club christened on April 17, 1902. 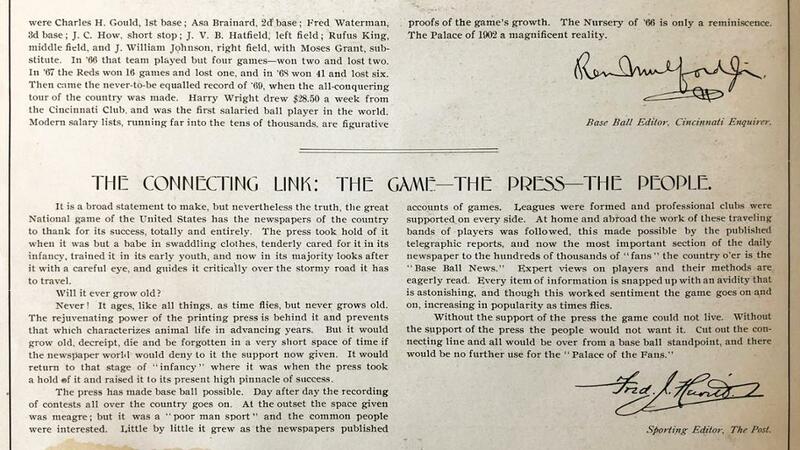 Its official name was the rather pedestrian League Park but it will forever be known by its popular nickname, "The Palace of the Fans." 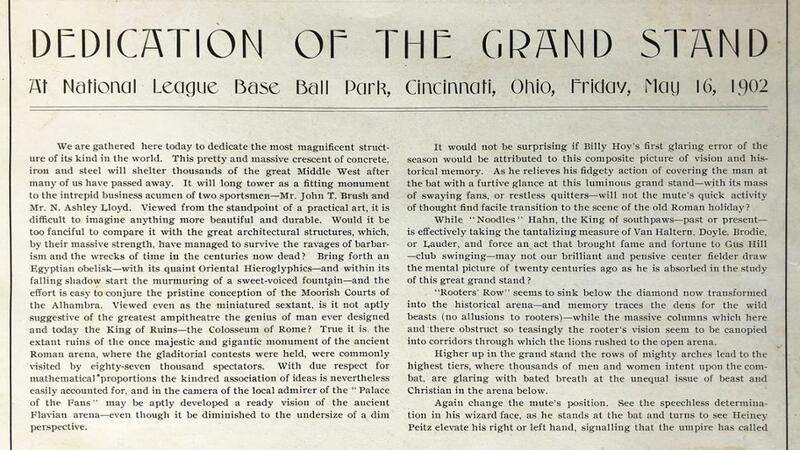 The lofty title was well earned as the Reds 'new home was unlike any ballpark built before or since. Inspired by the architecture of Ancient Greece and Rome, the Palace's design made the emphatic statement that baseball had completed its evolution from sport to vital institution. That evolution had been sparked in 1869 when Cincinnati's Red Stockings implemented a professional system that resulted in a team that became a national phenomenon. The Red Stockings' model was adopted throughout baseball and in the span of a but a few decades, baseball and America had become inexorably linked. In the Palace of the Fans, the Reds created one of the grandest physical testaments both to baseball's prominent status in the national culture and to Cincinnati's critical role in making the game what it was and what it continues to be. 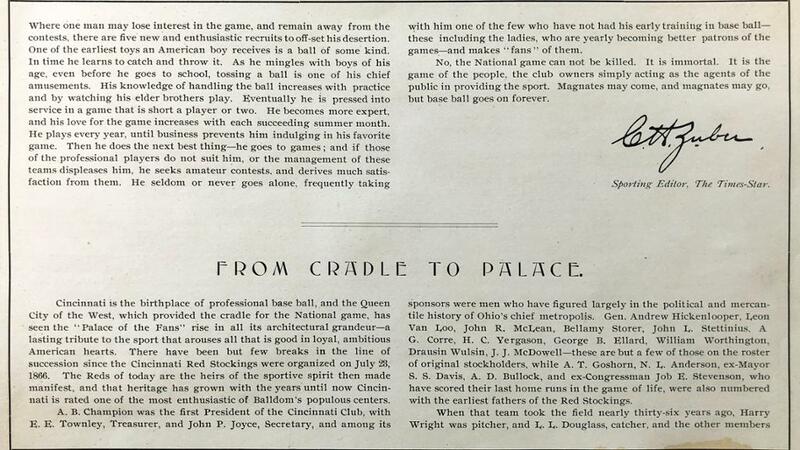 The images below are scanned excerpts from the Palace of the Fans dedication book from 1902.